What follows is the forward to the print edition, available here. © Copyright: 2006 Finalrevelation.net, Houston, Texas. No part of this publication may be reproduced or utilized in any form or by any means, electronic or mechanical including photocopying and recording or by any information storage and retrieval system, without the prior written permission of the copyright owner. No part of this book may be translated into any other language without the prior written permission of the copyright owner. The Qur’an is the final revelation for the Guidance of mankind from the same Almighty God who sent Abraham, Moses, and Jesus. This Qur’an is translated / interpreted word-for-word from Arabic to English in a simple way so that it can be understood easily by everyone. We used Allah (One and only like Him instead of God) throughout. Any word needed to clarify a meaning is added in parenthesis. All 25 names of the prophets mentioned in the Qur’an are listed as English names so the reader can find the same name mentioned in previously revealed scriptures. 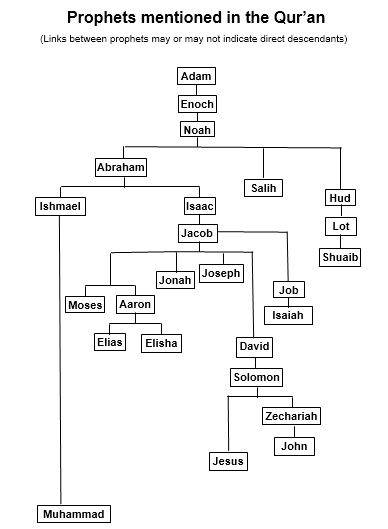 A Prophet tree is provided at the beginning with a list of places, nations, landmarks, etc. for each prophet as references. A map is provided to show the location of each of these places and nations. A brief list of the life events of Prophet Muhammad is given to understand the goals and objectives of his mission. Since he has been sent as the final Messenger for the entire universe until the Last Day of this world, all of his efforts focused on reaching out to all nations through delegations and letters towards peace for all mankind. He personally traveled many expeditions and wrote letters to different kings and rulers of different nations. Besides the Qur’an, all of his sayings with events (Hadith) narrated by his companions during his lifetime and afterwards were preserved and recorded in systematic order so a reader can find the detailed reference / reason in Hadith for any particular revelation in the Qur’an which was revealed during 23 years. Two copies of the originally compiled Qur’an are still preserved in Tashkent, Uzbekistan and Istanbul, Turkey. Today’s Arabic Qur’an is the same as the one originally compiled. 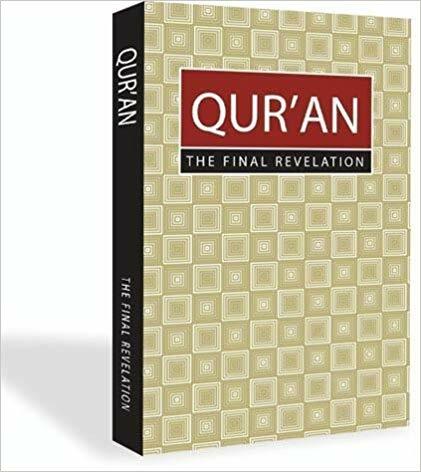 All this information will help the reader understand the continuation of the religion of Abraham through Moses, Jesus and finally through Muhammad, who has been sent with this Qur’an to deliver the final version of the religion of Allah to mankind, Islam. Birth of Prophet Muhammad at Makkah (March / April). His father Abdullah died several months before he was born. He was raised by Halimah as wet-mother according to Makkah's tradition. Death of Aminah (Prophet's mother). Muhammad was taken care by his grandfather Abd Al-Muttalib. Death of Abd Al-Muttalib. Then Muhammad grew up under the protective care of his uncle Abu Talib. Journey to Syria with uncle Abu Talib. Worked as a shepherd for his uncle and later as a merchant. He lived a simple life. He was compassionate to the poor, widow, and orphans. He volunteered in many community activities. People of Makkah named him 'Al-Siddiq (the Truthful)' and 'Al-Ameen (the Trustworthy)' due to his honesty and good character. Acted as a business agent for Khadijah, a business woman of Makkah. Muhammad carried goods to the north and returned with a profit. Impressed by Muhammad's honesty and character, Khadijah (who was a widow) proposed for marriage and eventually they got married. He was 25, she was 40. Kabah was rebuilt by the people of Quraish. Muhammad helped to resolve disputes between the tribes. First revelation came (August) to Muhammad at Cave Hira with a message (verses 96:1-5) from Allah by the Angel Gabriel. Received several verses during this period and later they were compiled to become part of the Qur'an. He was belittled, ridiculed, then persecuted and physically attacked by the people of Makkah for his message of 'Oneness' of Allah, departing from the traditional tribal ways, including idol worshipping at the Kabah. 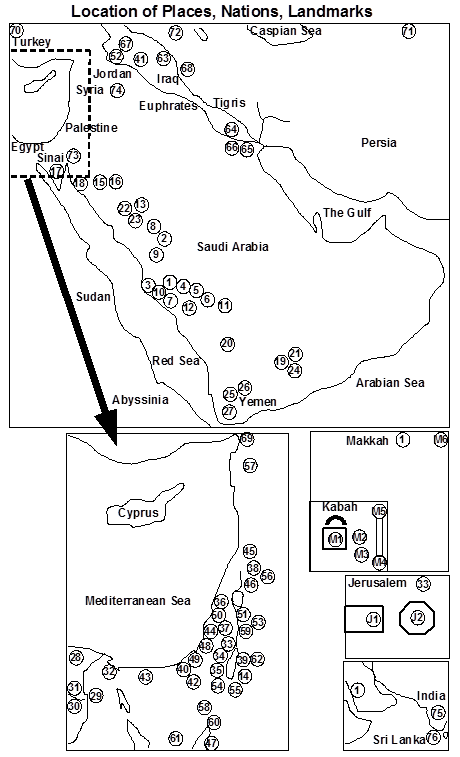 Muslims emigrated to Abyssinia to avoid sufferings / persecution from the people of Makkah. The king Negus offered asylum. Embargo and boycott of Prophet's family by the people of Quraish. Death of Abu Talib, Prophet's uncle. Death of Khadijah, Prophet's wife. The Quraish tried to assassinate him. Journey to Taif. Talked with the community leaders and people to convey his message. They rejected and stoned him to injury. Ascension of Prophet Muhammad on the night of Meraj with angel Gabriel. The journey took him from Makkah to Jerusalem and then through the 7 heavens. Allah showed him all the activities, features of heaven and hell. He was then returned to Makkah with full knowledge, so he was able to describe everything. First Pledge of Al-Aqabah (between the prophet and 12 people from Madinah). They swore allegiance to him. Second Pledge of Al-Aqabah (between the prophet and 75 people from Madinah). They swore to defend him. Emigration to Madinah (July). Established Quba Masjid as the first Masjid of Islam. Treaty with Jews and non-Muslims in Madinah with equal rights of citizenship and full religious liberty. Expedition of Hamza (December). Expedition of Ubaidah (February); Al-Kharrar Expedition (March); Marriage to Aisha (April); Al-Abwa' Expedition (June); Buwat Expedition (July); Safawan Expedition (First Badr) (July); Ushairah Expedition (October). Abu Salamah Expedition (July); Abdullah bin Unais Expedition (July); Dhatur-Riqa' Expedition (July); Al-Mundhir bin Amr (August); Raji Expedition (August); Daumatul-Jandal Expedition (August); Banu An-Nadir Expedition (September). Banu Mustaliq Expedition (January); Ahzab Expedition (Trench around Madinah to defend the city) (February - March); Banu Quraizah Expedition (April); Second Badr Expedition (May); Al-Qurata Expedition (June); Banu Lihyan Expedition (August); Dhu Qarad Expedition (August); Ghamr Expedition (August); Dhul-Qassah Expedition (September); Dhul Qassah (Abu Ubaidah) Expedition (September); Zaid bin Harith 5 Expeditions (August / 627 - February / 628). Daumatul-Jandal (Abdul Rahman bin Awf) Expedition (January); Fadak Expedition (January); Khaibar: (Abdullah bin Atik) Expedition (February), (Abdullah bin Rawaha) Expedition (March); 'Urainah Expedition (March); Ad-Damri Expedition; Treaty of Hudaibiyah between the Quraish of Makkah and Muslims (April). The Prophet Muhammad and Muslims returned to Madinah without Umrah as a part of the treaty with a provision to return to Makkah next year for Umrah. Makkans breached the treaty a year later. 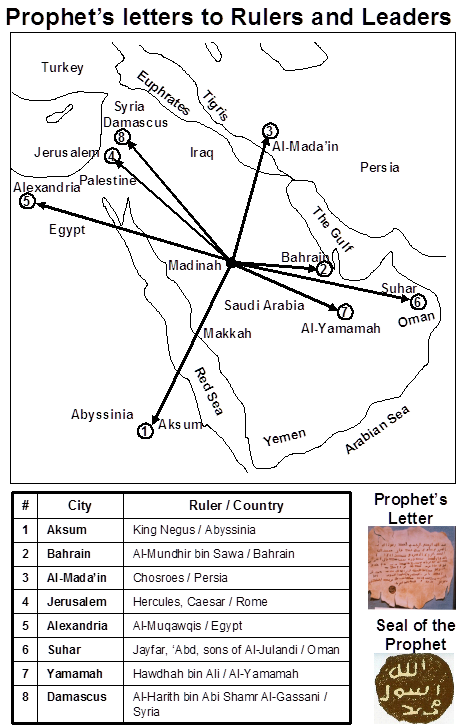 Invitation letters to Kings and world leaders (April - May) of Abyssinia, Bahrain, Persia, Jerusalem (Roman King), Alexandria, Oman, Yamamah, Damascus. See attached map later. Khaibar Expedition (May - June). Abu Qatadah Expedition (January); Victory of Makkah (January); The Prophet entered Makkah with 10,000 Muslims without any bloodshed. The Makkans joined the Muslims after they saw no revenge or retaliation rather he announced general amnesty to all the enemies and treated the citizens of the city with generosity. Nakhlah (Khalid bin Al-Walid) Expedition (January); Suwa-Banu Hudhail (Amr bin Al-'Aas) Expedition (January); Al-Mushallal (Sa'd bin Zaid) Expedition (January); Banu Jadhimah (Khalid bin Al-Walid) Expedition (February). Hunain Expedition (February); At-Taif Expedition (February). Birth of Ibrahim (Prophet's son) (March); Banu Tamim Expedition (May); Tabalah Expedition (June); Dahhak Al-Kilabi Expedition (July); Jeddah Expedition (August); Ali bin Abi Talib (August); Al-Asadi Expedition (August). Death of Negus, King of Abyssinia (October). Tabuk Expedition (October - December). Death of Ibrahim (Prophet's son) (January). Hajj Pilgrimage led by Abu Bakr (March). Najran Expedition by Khalid (July). Yemen Expedition by Ali (January); Last Revelation (February - March). Farewell Pilgrimage to Makkah and thousands of Muslims joined (February - March). Last Sermon at Arafat (March); Usamah Expedition (June). Ø made people live with faith, sincerity and honesty; transformed the nation from the ignorance of darkness into fully knowledgeable societies. Ø His mission transformed a society from all forms of injustice into universal human brotherhood as servants of Allah. Within 100 years, Islam and his way of life had spread from the remote corners of Arabia to as far east as Indo-China and as far west as Morocco, France, and Spain. He is the LAST messenger for the entire world from the SAME Allah of Abraham, Moses, and Jesus. The Qur'an is the FINAL REVELATION. * Prophet Muhammad participated in expeditions in Bold. O People, just as you regard this month, this day, and this city as sacred; so regard the life and property of every Muslim as a sacred trust. Return the goods entrusted to you to their rightful owners. Hurt no one so that no one may hurt you. Remember that you will indeed meet your Lord, and He will indeed reckon your deeds. Allah has forbidden you to take usury (interest); therefore all interest obligations shall henceforth be waived. Your capital, however, is yours to keep. You will neither inflict nor suffer inequity. Allah has judged that there shall be no interest and that all the interest due to Abbas ibn 'Abd'al Muttalib shall henceforth be waived. Every right arising out of homicide in pre-Islamic days is henceforth waived and the first such right that I waive is that arising from the murder of Rabiah ibn al Harith. O People, the unbelievers indulge in tampering with the calendar in order to make permissible that which Allah forbade, and to forbid that which Allah has made permissible. With Allah, the months are 12 in number. 4 of them are holy, 3 of these are successive and one occurs singly between the months of Jumada and Sha’ban. Beware of Satan, for the safety of your religion. He has lost all hope that he will ever be able to lead you astray in big things, so beware of following him in small things. O People, it is true that you have certain rights with regard to your women, but they also have rights over you. Remember that you have taken them as your wives only under Allah's trust and with His permission. If they abide by your right then they have the right to be fed and clothed in kindness. Do treat your women well and be kind to them for they are your partners and committed helpers. And it is your right that they do not make friends with any one of whom you do not approve, as well as never to be unchaste. O People, listen to me in earnest, worship Allah, say your five daily prayers (Salah), fast during the month of Ramadan, and give your wealth in Zakat. Perform Hajj if you can afford it. You know that every Muslim is the brother of another Muslim. You are all equal. Nobody has superiority over another except by piety and good action. Remember, one day you will appear before Allah and answer for your deeds. So beware, do not astray from the path of righteousness after I am gone. All those who listen to me shall pass on my words to others and those to others again; and may the last ones understand my words better than those who listen to me directly. Be my witness O Allah that I have conveyed Your message to Your people. The Prophet used to recite the Qur'an before angel Gabriel once every Ramadan, and he recited it twice (in the same order as we have today) in the last Ramadan before his death. Each verse received was recited by the Prophet, and its location relative to other verses and chapters was identified by him. The verses were written by scribes, selected by the Prophet, on any suitable object - the leaves of trees, pieces of wood, parchment or leather, flat stones, and shoulder blades. Scribes included Ali Ibn Abi Talib, Mu'awiyah Ibn Abi Sufyan, Ubey Ibn Ka'ab, and Zayed Ibn Thabit. Some of the companions wrote the Qur'an for their own use. Several hundred companions memorized the Qur'an by heart. Umar Ibn Al-Khattab urged Abu Bakr to preserve and compile the Qur'an. This was prompted after the battle of Yamamah, where heavy casualties were suffered among those who memorized the Qur'an. Abu Bakr entrusted Zayed with the task of collecting the Qur'an. Zayed had been present during the last recitation of the Qur'an by the Prophet to Angel Gabriel. Zayed, with the help of the companions who memorized and wrote verses of the Qur'an, accomplished the task and handed Abu Bakr the first authenticated copy of the Qur'an. The copy was kept in the residence of Hafsah, daughter of Umar and wife of the Prophet. Uthman ordered Zayed Ibn Thabit, Abdullah Ibn Al Zubayr, Saeed Ibn Al-Aas, and Abdur-Rahman Ibn Harith to make perfect copies of the authenticated copy kept with Hafsa due to the rapid expansion of the Islamic state and concern about differences in recitation. Copies were sent to various places in the Muslim world. The original copy was returned to Hafsa, and a copy was kept in Madinah. Dots were put as syntactical marks by Abu Al-Aswad Al Doaly, during the time of Mu'awiya Ibn Abi Sufian (661-680 CE). The letters were marked with different dotting by Nasr Ibn Asem and Hayy ibn Ya'mor, during the time of Abd Al-Malek Ibn Marawan (685-705 CE). A complete system of diacritical marks (damma, fataha, kasra) was invented by Al Khaleel Ibn Ahmad Al Faraheedy (d. 786 CE). Original copies of the Qur’an still exist: (1) Tashkent, Uzbekistan, (2) Istanbul, Turkey.